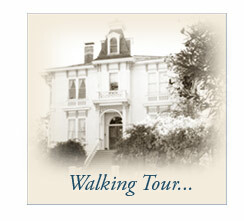 Your tour today will take you through old town Pinole, the city’s center of life back at the turn of the 20th century. Many of the buildings built at this time remain standing today. You will have an opportunity to see some of these buildings and learn more about the original settlers who lived and worked in Pinole during the early 1900s. Unfortunately, not all of the buildings have survived. To help you imagine what these buildings might have looked like, the tour also includes the many murals that have been commissioned by the city, a number of which incorporate several of Pinole’s historic buildings. Your tour starts at the mural located on the façade of the old Greenfield Department Store building, in the city parking lot, adjacent to Pinole City Hall and the Public Service building. Stop #1: Greenfield Department Store. Built in 1905 by Abraham Greenfield, it housed Pinole’s first department store. Fernandez Mansion & the American Hotel Mural. To begin your journey back in time, take a look at the two buildings depicted in the mural on the building’s facade. Stop #2: Charles & Tessie Baldwin House (2235 San Pablo Avenue). The home originally housed a slaughterhouse and butcher shop, but was remodeled into a residence in the 1870s for Cipriano Silvas and his wife Maria Rosario Alvarado Silvas. Stop #3: Italianate Hip Roof Cottages (1885), 2181, 2161, 2156, and 2150 San Pablo Avenue). As you continue your walk up San Pablo Avenue, you will walk past four Italianate Hip Roof Cottage homes. They have tall narrow windows and a small flat area at the roof peak. Stop #4: Pinole Hercules Methodist Church (2131 San Pablo Avenue). Just past the Italianate cottages, you will come to the building that housed the first Pinole-Hercules Methodist Church. This Gothic Revival Style church was built in 1898. Stop #5a: Pinole Historical Society Mural. Just beyond the church building, you will come to a bus turn-out. Pause for a moment and gaze across the street to view the rather large mural, which portrays a number of buildings that played a significant role in Pinole’s history. Stop #5b: Faria House (Heritage Park at 2100 San Pablo Avenue). This farmhouse, formerly located on the north hillside of Pinole Valley Road and I-80, was built by William Allen in 1891, for his daughter, Louise, as a wedding gift when she married James H. Tennent. Tennent eventually sold the house, along with 4.5 acres, to the Joseph Dutra Faria family. It was relocated to downtown Pinole in 2005. Stop #6: Quinan Street Homes. Quinan Street was named after Capt. William Russell Quinan, a West Point graduate who was superintendent of the California Powder Works Plant from 1883-1902. The plant, established in 1879, was located in Hercules. Quinan emigrated to South Africa in 1902 to take up a position as explosives expert with De Beers. He died in Wahroonga, New South Wales, Australia, on August 15, 1910. Stop #7: Tennent Avenue. You should now find yourself at the entrance to Fernandez Park. Before entering the park at the front of Memorial Hall, take a moment to try to picture Tennent Avenue as it was in the early 1900s, as this was Pinole’s main commercial center. On both sides of the street, wooden boardwalks ran from the wharf up and across San Pablo Avenue. Stop #9: Antlers Tavern (2284 San Pablo Avenue). After you exit the park, continue walking through the parking lot to the ‘4 corners’ area of Pinole (Tennent and San Pablo avenues). Across Tennent Avenue, you will find Antlers Tavern, built in 1890. Stop #10: Nunes Building (2310 San Pablo Avenue). The building on the corner where you now stand is the Nunes Building. Originally, this building was a two-story wooden structure, housing several stores on the lower level and rentable rooms on the upper floor. Stop #11: Bank of Pinole (2361 San Pablo Avenue). Although the Bank of Pinole was organized in 1905, the building you see before you was built in 1915. E. M. Downer Sr. created the Bank of Pinole, eventually expanding his banking business into Mechanics Bank. Stop #12: Boyd Home (2454 San Pablo Avenue). Cross back over San Pablo Avenue at Fernandez Avenue to view the Boyd Home, built in 1874, (now the Pinole Creek Café). The original owner of the home was John Boyd who together with his partner, John Fraser, owned and operated a blacksmith shop that sat between their two homes on San Pablo Avenue. Stop #13: William Clark Home (2494 San Pablo Avenue). William Clark joined his brother, Charles Clark, in the grocery store business that Charles started in 1901. The grocery store (located across the street on the corner to the left) had living quarters on the second,floor. Stop #14: Theodore Woy Home (2497 San Pablo Avenue). The corner home directly across San Pablo Avenue is the T.J .Woy home. Mr. Woy bought the home and adjacent building that housed a bakery, in 1906 from J.B. Downer. Stop #15: Square Deal Garage (2500 San Pablo Avenue). On the northeast corner of San Pablo Avenue and Pinole Valley Road sits the Square Deal Garage. In response to the growing popularity of the automobile, B.G. Hall built the garage in 1928. San Pablo Avenue Queen Anne Homes. The homes at this intersection, as well as those you will view as you continue your walk along San Pablo Avenue, were all built before the turn of the 20th century. All of these homes are of the Queen Anne style, typical of the urban residential architecture of the late 1800s. Stop #16: TJ Stats Home (2518 San Pablo Avenue). Continue down San Pablo to the T.J. Stats home. Stats at one time ran the local barbershop and, after incorporation in 1903, was one of the original members of the city’s board of trustees. Stop #17: Jerry McDonald Home (2530 San Pablo Avenue). Jerry McDonald was the constable of the township and, along with his brother Fred, was co-owner and operator of the McDonald Brothers Store, a men’s clothing store that was located on Tennent Avenue. Stop #18: Captain's Cottage (2548 San Pablo Avenue). Most notable of the Queen Anne style homes in Pinole is the Captain’s Cottage, built in 1895. This is the only Queen Anne-style structure with a tower in Pinole. Stop #19: Santa Fe Train Depot. Just up the street, looking behind the Captain’s Cottage, try to imagine the busy Santa Fe Train Depot as it once stood, moving passengers in and out of Pinole to cities like San Francisco, Stockton, Bakersfield, and beyond. Stop #20: Downer Mansion (2711 San Pablo Avenue). At the crest of the hill here, across San Pablo Avenue, above John Street, stands the Downer Mansion, built in 1905. The home was built by Edward M. Downer Sr., founder of the Bank of Pinole (later named Mechanics Bank). Stop #21: Original site of Pinole-Hercules School (800 John Street). Pinole Grove, an independent living facility for seniors, is located on the site of Pinole’s second school, the Pinole-Hercules School, operable from 1906-1966. Stop #22: Second Pinole Hercules Methodist Church (755 Pinole Valley Road). As Pinole continued to expand, so did its churches. After completing construction in 1925, the Pinole Hercules Methodist Church moved from its San Pablo Avenue location to this gable-roof, red-brick building originally graced with beautiful stained glass windows in place of the white shutters you see before you. Stop #23: Brandt Cottages (923, 931, 947, 963, 979, 999 Valley Road). Turn left onto Pinole Valley Road. Across from the creek, you will find the Brandt cottages. Caroline S. Brandt owned the land and commissioned a local builder to build these six cottages. Stop #24: St. Joseph Catholic Church (837 Tennent Avenue). The mission-style church you see here today was built in 1951. The original gothic-revival style church was a wooden structure, built in 1881. The following historic homes included on the tour are located farther out from the core Old Town area and are accessible by automobile. Stop #25: Fernandez Mansion (100 Tennent Avenue, located at the end of Tennent Avenue, near the bay). The Fernandez Mansion was built for Bernardo and Carlotta Fernandez in 1894. Bernardo Fernandez, a Portuguese immigrant, was the founder of the wharf and shipping business in Pinole beginning in the 1850s. Stop #26: Dr. Manuel L. Fernandez House (480 Tennent Avenue, located above the railroad trestle). The house is best viewed from the stop sign at La Salle and Tennent avenues. This private residence is the best example of a Prairie-style bungalow in Pinole. The large home and guesthouse are located on top of a large parcel of land overlooking the town.